No one likes to look at or to use tarnished silverware, and getting it sparkling is easier than you might think. 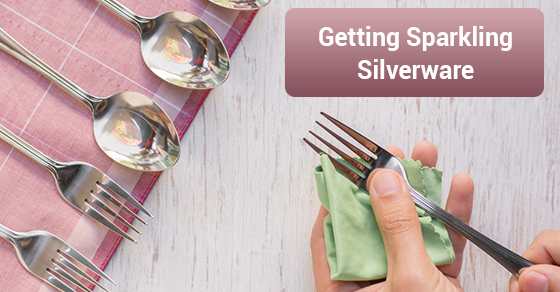 This is probably one of the most tried and true methods for cleaning silver. Combine a litre of water, a tablespoon of baking soda and a piece of aluminum foil in a pan and bring to a boil. Drop silverware into the pot for about 15 seconds (or more if very tarnished). Remove and voila! Your silverware will look brand new! Take aluminum foil and line a medium-sized bowl with it. Fill with hot water. Add about a tablespoon of powdered laundry soap, add your silver and let it soak for about a minute. Remove, buff and see the shine. Take a paper towel and squirt a bit of ketchup onto it. Rub onto tarnished areas on the silver. For badly tarnished pieces, let the ketchup sit on the silver for about 15 minutes, rinse off and rub with a soft cloth. If the silver has recessed or decorative areas, you may need to use a soft toothbrush to get into the grooves. Make a paste out of cornstarch and water. Apply it to your silver with a damp cloth and let it dry. Use something with texture to buff it. Cheesecloth is a good choice. But if you feel at all overwhelmed at the idea of silver cleaning, there are customized cleaning services you can call to hire someone to get your silver gleaming for you. There are more uses for hand sanitizer than disinfecting hands, and cleaning silver happens to be one of them. Add a few drops to a soft cloth and polish the tarnish away. Add your tarnished silverware to a bowl of fizzy lemon-lime soda. Go and do something else for about an hour and by the time you’re finished this task, the soda will have worked its magic and your silver will be gleaming. A small tab of toothpaste on a rag to polish silver pieces will make them super shiny. Rinse with warm water after applying and dry with a soft cloth. If you leave a few pieces of chalk in the drawer where you store your silverware, it will keep it from tarnishing. Chalk absorbs moisture – the prime culprit that causes your silver’s shine to fade.